Your veterinarians in western New York State! Most appointents can be made within 1 to 2 days...AND, if available,even on the same day!For appointments, questions andconcerns call 679-1561. Here at the Fredonia Animal Hospital, there is a $10 rebate if you buy one 6-dose box of Advantage flea control. $12 rebate on 6-dose boxes of Advantix (fleas/ticks for dogs) or Advantage Multi (fleas/heartworms for dogs). Rebates only available through animal hospitals. Frontline GOLD (available only through veterinarians) - a box of 3 doses gets you one tube FREE; box of 6 doses gets you 2 tubes FREE. NexGard Oral Chews - a box of 6 gets you one chew FREE! Any new patient (new or current client) - one FREE dose of Advantage, Advantix, Frontline GOLD or Nexgard oral flea control with exam! Puppies also get their first dose of Heartgard Plus FREE! Veterinarians Dr. Jon Redfield and Dr. Josef Powell at Fredonia Animal Hospital are one of the best team of veterinarians in the Fredonia area and are committed to your pet's health and well being. Fredonia Animal Hospital excels in pet care and the science of veterinary medicine. History and Experience: The doctors and staff at Fredonia Animal Hospital have provided our community with compassionate veterinary care and pet services since 1969, making us the animal clinic of choice for pet owners in and aroundFredonia, Chautauquaand Cattaraugus counties and southernErie county. Dedication: Fredonia Animal Hospital is a full-service animal hospital whose mission is to provide the highest standard of veterinary care for pets.Wehave a remarkable and highly educatedstaff.We invest in our patients by constantly educating and training our staffmembers and building our client education program. Our staff attends monthly or twice monthlyeducation meetings. We also make sure they attend regionaland national seminars to learn from their peers, be they kennel managers, receptionists, technicians or doctors. 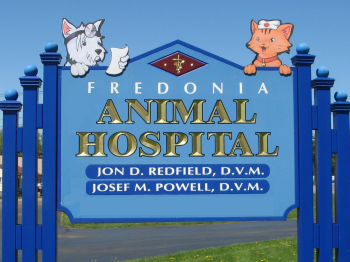 Services: The Fredonia Animal Hospital offers the Fredonia community emergency veterinary care as well as medical, surgical, and dental services. We also have an in-house pharmacy, laboratory, radiology suiteand climate controlled hospital wards and boarding facilities. With access toveterinary specialists nearby,our veterinary facility is a one-stop shop for your pet's health and medical needs. Remember, atthe Fredonia Animal Hospital, your pets are our family! Family Oriented: We believethat to provide the best veterinary care to your pets we must bring the family into the picture from the very beginning.We encourage children to attend health checks and tour the facility. We understand that the pet members of the family are crucial in theemotional development of the child. Questions and concerns arise.Trust our staff in knowing that they will provide age appropriate answers to their questions including child geared grief counseling as needed. We genuinely care about the pet members of your family! Our staff is passionate about veterinary medicine. We strive to provide professional, affordable, and advanced veterinary services. At the Fredonia Animal Hospital, you will walk into a clean, calm, welcoming, and friendly environment every visit, so that the experience is as comfortable as possible for you, your family and your pet. Accredited: The Fredonia Animal Hospital is one of only 15% of veterinary practices in North America accredited by the American Animal Hospital Association (AAHA). There are only two accredited veterinary facilities in Chautauqua County and the Fredonia Animal Hospital is the only one in the northern end of the county. AAHA is the only organization that accredits animal hospitals throughout the U.S. and Canada. AAHA-accredited hospitals voluntarily choose to be evaluated on 900 rigorous standards in the following areas: quality of care; diagnostic & pharmacy; management; medical records; and facility. A hard, but well earned, accreditation from AAHA meansthat this facility is among a very select few in the country trusted by our professional peers to provide the best care in the safest environment. Website: Look no further than this site to provide you with accurate veterinary medical and behavioral information. You can be assured that the information obtained here is approved by the doctors and staff of FAH. On the bar above, click on Pet Health to find hundreds of articles! Search by topic and/or species.If you need information on any topic, behavior or medical, that you do not see on this website, call us and we would be happy to mail or e-mail you information. If you are new to our website, please browse around to learn about our facility and to read interesting pet articles and watch groundbreaking pet videos.In our new patient center you will find links to valuable veterinary resources, grief counseling links as well as FAH staff favorite animal TV shows! For directions to our office see our contact us page. To receive free monthly veterinary care articles, please subscribe to our newsletter. Look for us on Facebook too. Dr. Jon D. Redfield has owned the Fredonia Animal Hospital since 1999. Born and raised in central New York, he graduated from Homer Central High School and completed a 4-year tour of duty in the United States Army Veterinary Corps as a veterinary technician. "Took our beloved feline " Puppy" in to be put to sleep due to many health issues / concerns. The staff and Dr. Redfield were very professional, compassionate, understanding and very supportive during this very tough time. Thank you so much for all you did for our girl during her 16 + years with us. She is smiling down on us from kitty heaven."